Shakespeare said, “There’s rosemary, that’s for remembrance; pray, love, remember.” The saying “rosemary for remembrance” is obviously taken from this quote, but interestingly enough, science shows us that rosemary and memory do have a connection. Several studies show that rosemary actually stimulates memory and may preserve some cognitive function. Who knew? I love rosemary. 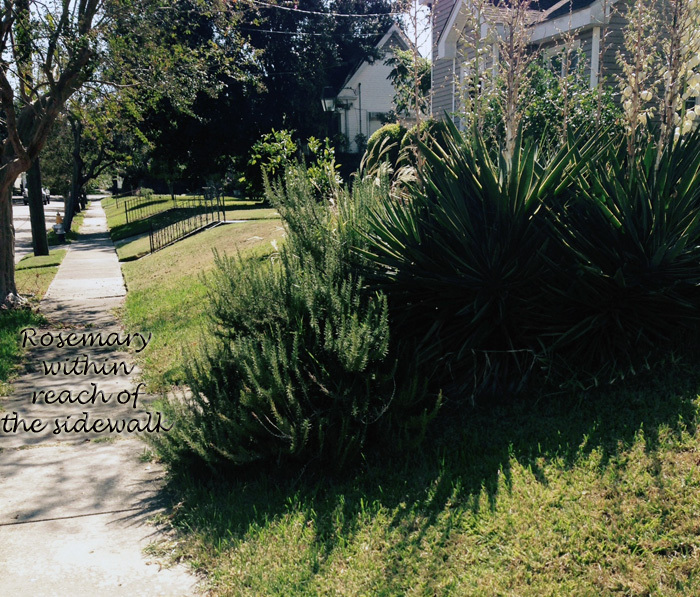 One of the things I found fascinating in New Orleans is the number of people who use rosemary as an ornamental shrub. Maybe, they use it to snip for culinary uses as well. I hope so. 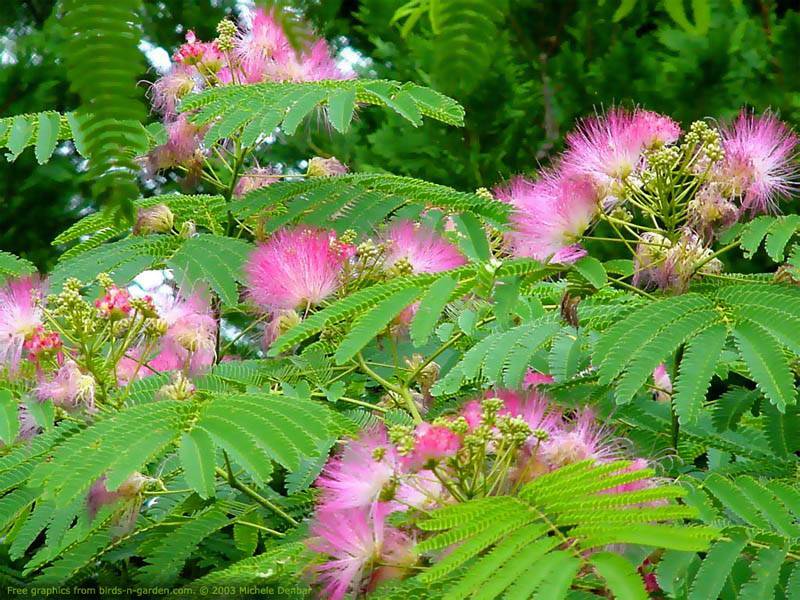 I have actually been known to snip a bit off some of these shrubs as I’m out for a walk (don’t tell anybody). My own pot of rosemary is pretty sad. I think it is actually a creeping rosemary rather than the upright plant I thought I was getting. Well, as luck would have it, rosemary is easy to propagate so I decided to add a little upright rosemary to my already creeping pot. I snipped a bit of rosemary from an upright shrub, removed the leaves (or needles) from the lower 2/3 and put them in a small vase of water. This is the way I usually try propagating everything at first because it is so easy. It doesn’t work for everything, but actually is pretty reliable on a lot of plants (at least the things I propagate). 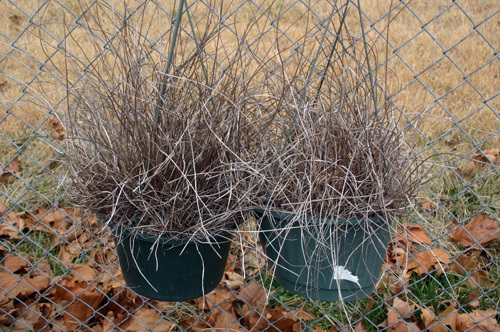 You can also put the cut stem in a rooting hormone and plant it in potting medium and cover until new growth appears. I may have rooting hormone around here somewhere – I think. 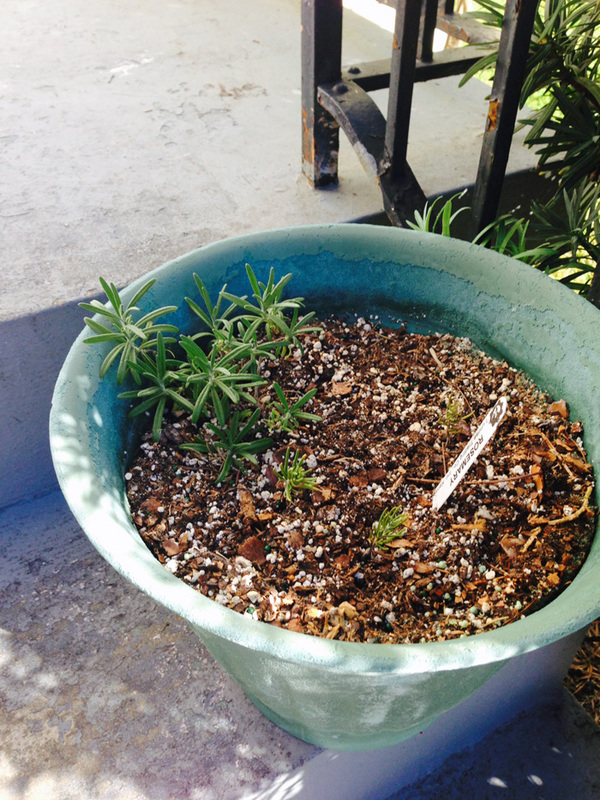 Here is the pot with the creeping rosemary and my newly rooted shoots. 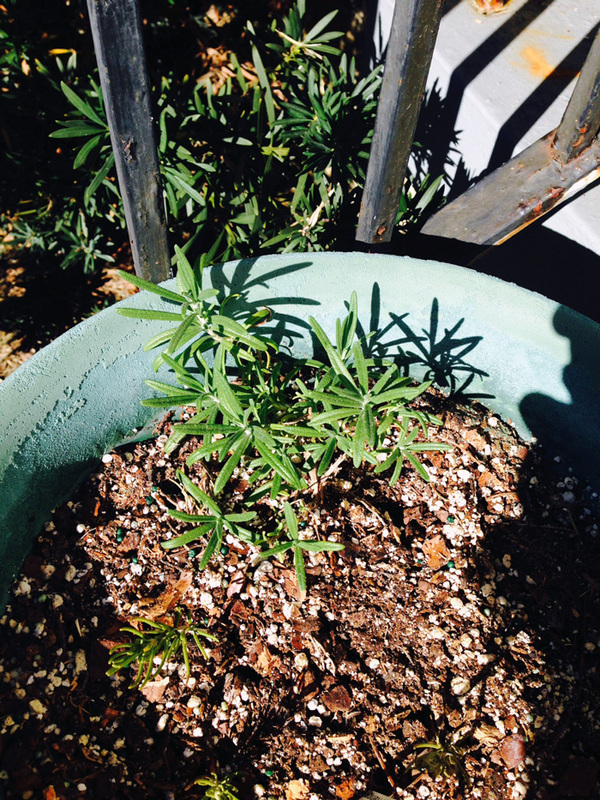 Hopefully, they will grow in harmony with the creeping rosemary and fill up the pot. I’ve got some more rooting in my kitchen window to add as well – can never get enough of a good thing. I learned to propagate plants this way from my grandmother, who was always snipping cuttings. At one time, she lived on a farm and I think she could grow anything. 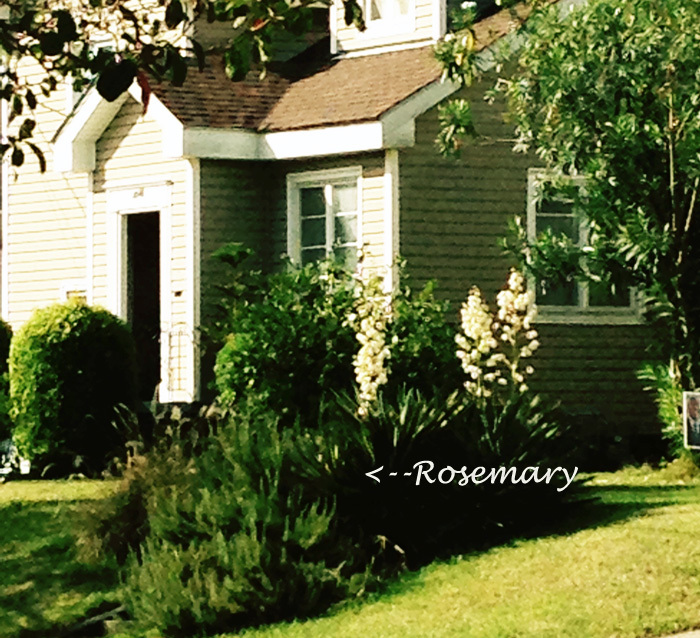 I will have this rosemary in remembrance of her. March 2 is the last spring frost date in New Orleans, and I usually try to get my first vegetables planted around then to beat the summer heat. 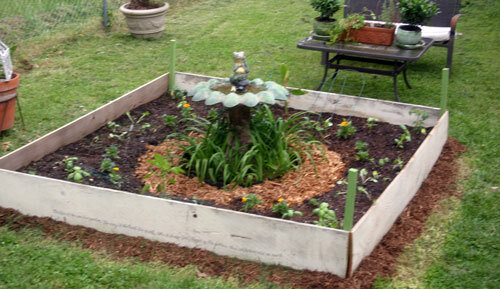 That was my project for a recent cold weekend, with lows in the mid-30’s but no frost. 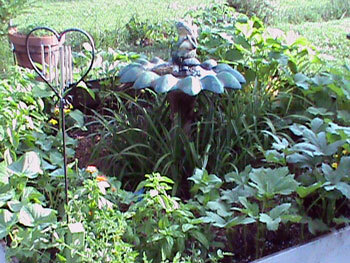 Since yards in the old part of town tend to be small, I’ve been container gardening for over 20 years. In went the tomatoes and peppers. Also for good measure bibb lettuce (a little late), green beans, and a basil plant. I passed on the eggplant for now even though they were available because cold weather supposedly stunts their growth. 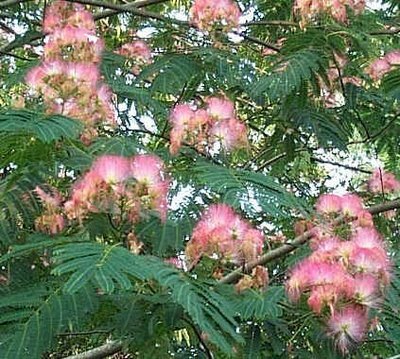 I usually plant them in the beginning of April. 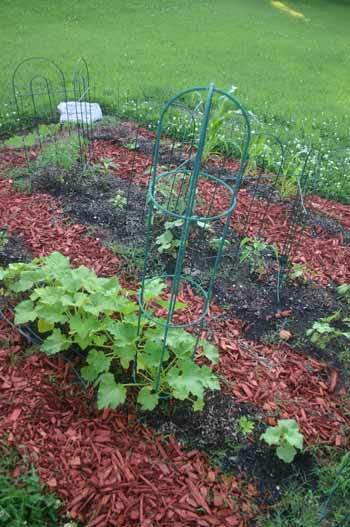 The okra will get their turn sometime in early summer. Every fall I plant broccoli. It does quite well in pots on my patio – container gardening is a trade off in the city for a nicely landscaped yard. In New Orleans transplants are generally available in early October, with harvest right around Thanksgiving. I was a bit surprised to find transplants at a big box garden center in early September. I decided to gamble on an early planting, perhaps getting a long season of side shoots if they could make it through our hot weather. 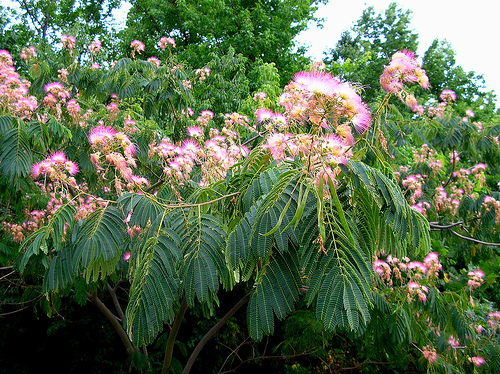 The transplants thrived, with lush, healthy green leaves. In fact, they seemed a lot fuller than usual. I was puzzled that no heads had emerged by mid November. Had the hot weather caused some problems? The leaves grew smaller and tighter, then one day I felt something hard in the middle. It then dawned on me…I wasn’t growing broccoli but cabbage! I have nine heads of cabbage just in time for the New Year. Luckily they store well, to give me a chance to find some interesting and different ways to cook this humble vegetable. In the meantime, here is a tried and true favorite. 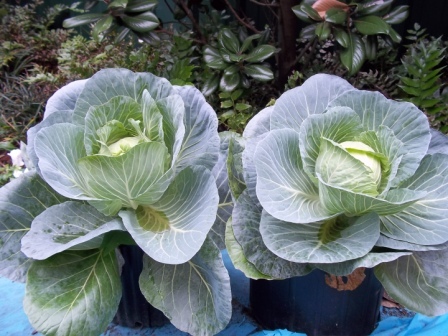 Cook cabbage in boiling water for 5 minutes or until tender; drain. In a large saucepan, saute 1 cup onion in butter until tender. Add the tomatoes, garlic, brown sugar and seasonings. Simmer for 15 minutes, stirring occasionally. 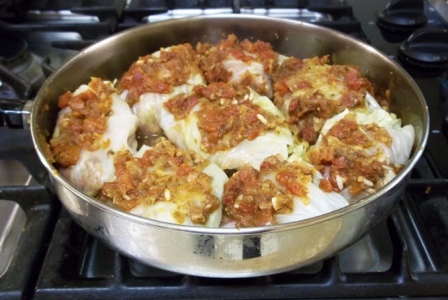 In a large bowl, combine the rice, remaining onion, beef, Worcestershire sauce, and ¼ cup tomato mixture. Mix well. Remove thick vein from cabbage leaves for easier rolling. Place about 1/2 cup meat mixture on each leaf; fold in sides. Starting at an unfolded edge, roll up leaf to completely enclose filling. Place seam side down in a skillet. Top with the sauce. Cover and cook over medium-low heat for approximately 1 hour. I have so many things that are close to harvest. 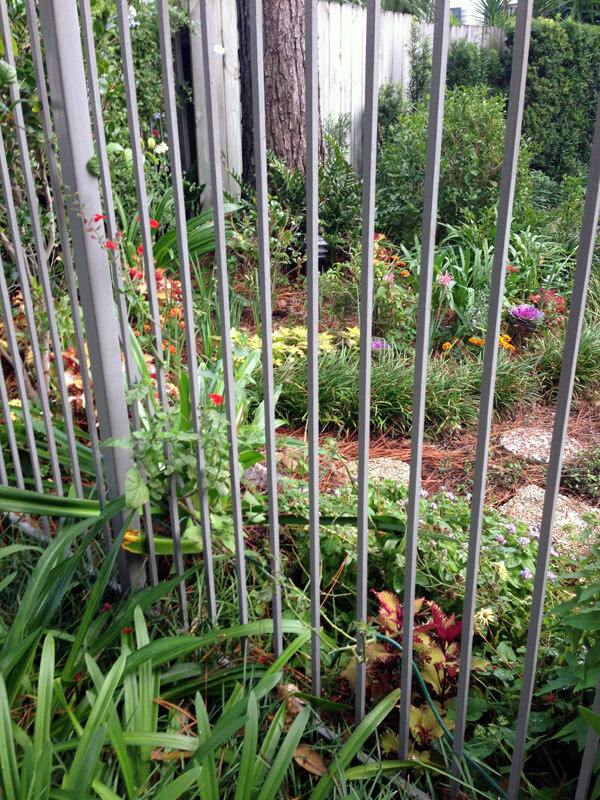 I remember when I was putting this garden in how I thought (as usual) that I must be crazy for going to all this trouble. Now is the fun time. I still need to water and fertilize and pull weeds and keep an eye on everything. Of course, I also have to harvest. It looks like it has kind of gotten out of hand! All of the plants have done so well and I am so pleased. 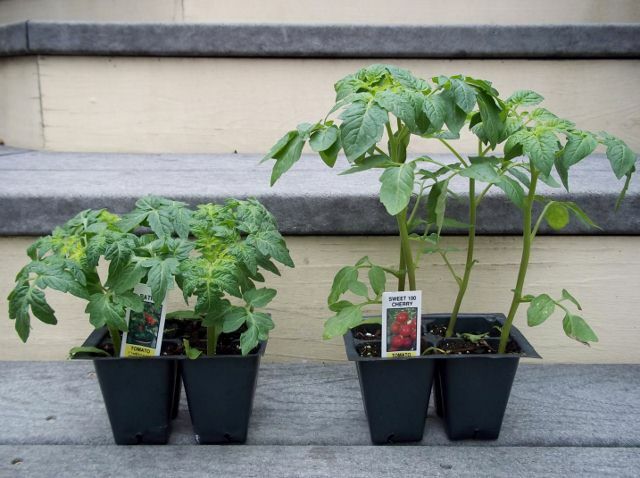 When I am putting in a garden, I always tell my husband, that even though it is a lot of work and still costs a little bit, it will always be cheaper than a psychologist and will give us food to boot. Gardening is such a wonderful therapy. Thank you God for a garden! I saw this recipe on the Food Network and since I have Parmesan and grow my own rosemary think this is one I will have to try! My, what a labor of love a garden is. Been working on getting my garden in this weekend. It is a bit late, but with soooooo much rain, I had to wait for a dry weekend. It turned out that this weekend was perfect. 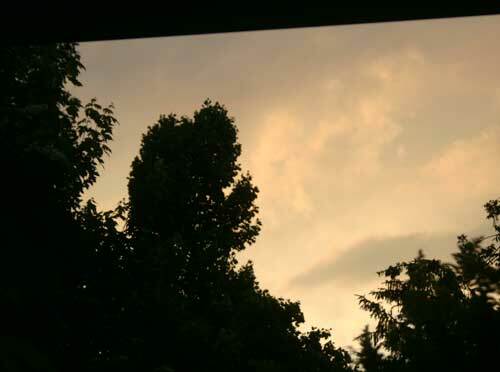 Cool temperatures with overcast skies but NO RAIN! Before I go on with this post, I want to pause and remember all of the people along the Mississippi River who are dealing with the aftermath of the massive rains, the floods. When I see that so many people are losing their homes, that so many farmers are losing their crops, my heart just breaks. I have been so encouraged by the spirit of the people in the areas that are going to flood. They are truly an inspiration. God bless them and please keep them in your prayers. I am blessed to live in a higher area in a town that is surrounded by lakes and rivers. We have had record amount of rain here which has kept me from putting in my garden earlier. However, this weekend was the perfect time! The best way to garden in my area is raised gardening. I built my raised garden out of my old herb planter. I took the planter apart to create my raised bed. A kiss of the sun for pardon. It is a small garden but I am looking forward to the fruits of my labor (which didn’t feel small). I have been gardening for some years now. It seems that for every garden I put in, at some point, I think, “What in the world do you think you are doing?” It does take a lot of effort but it truly does feed the soul. She who plants a garden is very happy indeed! I took a small planter and made a garden. The metamorphosis fed my soul. 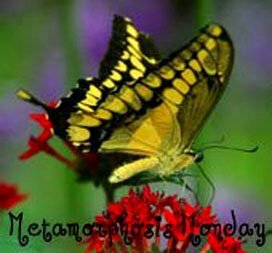 What other metamorphosis’ are going on in blogland? Check them out! If you have been around here awhile you may remember my past attempts at trying to keep my beautiful summer ferns alive inside through the winter. NOT a pretty site! Well, I have tried it again this year and, guess what? So far, I’m successful! If you are really successful keeping ferns through the winter, you may wonder what the big deal is, but this is really big for me. I have tried for years and ALWAYS end up with dead ferns. I am pretty good with house plants and have many that have been around for years. And, I am usually successful and keeping other plants inside for the winter, but never the ferns. As you can see from the picture above, they are outside today. That is because it is 70 degrees and humid and we are supposed to have storms later. This has been my trick. Even though it gets cold here and we have had a few snowfalls, we also have some mild days. 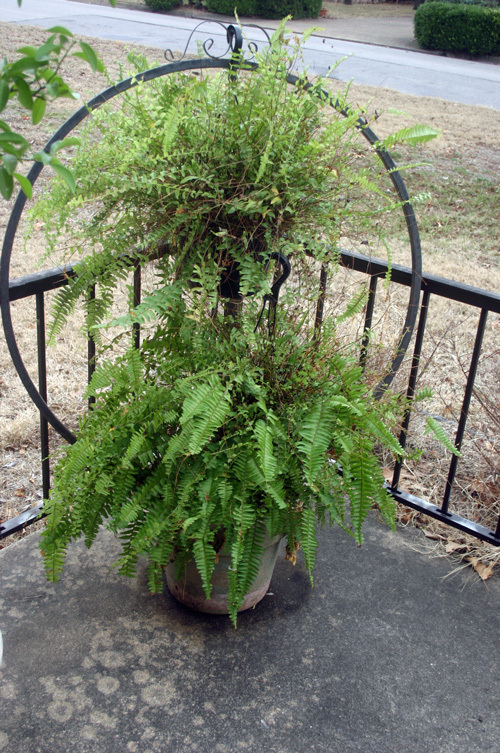 When we have the mild days, I take the ferns outside and water them really well and let them enjoy being outdoors. When they are inside, I have a spray bottle of water that I mist them with every few days. Woo Hoo! Here is my lemon tree that has done beautifully inside for many years. Hasn’t given me one lemon yet, but it has pretty citrusy smelling leaves. 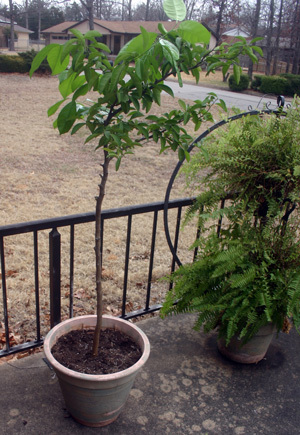 I guess that is my next plant challenge – getting that lemon tree to give me some lemons! Considering the price of lemons these days that would be another big woo hoo moment. 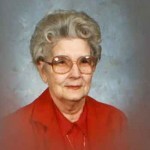 Hope your before and afters make you feel as great as this one did me! It’s almost time for Mardi Gras! This is a great dish to enjoy during Carnival season. Put water, crab boil, lemons & salt in a very large pot and bring to a boil. (Note: you may want to turn on your vent fan – that crab boil is strong stuff! Also, if you have a large basket that will fit in the pot that is helpful as well). Add onions, celery and red potatoes. Bring back to a boil and then cover and lower the heat. Simmer for around 15 minutes or until the potatoes start to get tender. Add the andouille sausage and the corn and cook for about 5 to 8 minutes more or until the corn starts to get tender. Add the shrimp and cook for 4 to 5 minutes or until they turn pink and are done. Carefully drain into a colander or remove the wire basket from the water. Place everything on a large platter. Serve with cocktail sauce, remaulade sauce, and hot French bread. The weather is getting hot, hot, hot and that is a great time to skip turning on the oven and just use veggies from the garden! So many wonderful possibilities springing from a few seeds! Tonight, I want to tell you about a wonderful site set up by Triscuit. Yes, Triscuit! Those wonderfully, delicious wheat crackers. They are promoting something close to my heart – growing your own HOME FARM! Check out their great site at http://www.triscuit.com/homefarming for some great ideas and tips on how you can grow your own home farm! They are even including seeds with their promotional boxes of Triscuits. 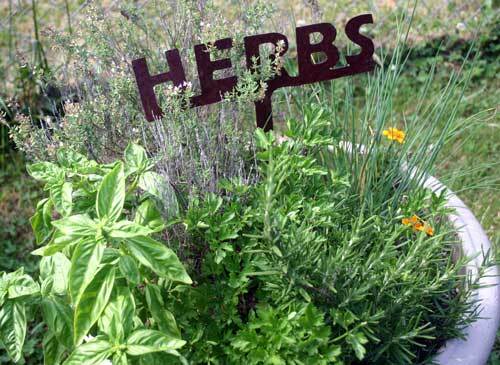 You know, even if you have already planted herbs, you can still plant more to extend your herb harvesting season! Triscuit was so kind to let me know about this program so I could pass it on to you here. They sent me 2 boxes of Triscuits – both original and reduced fat. By the way, there is very little difference in the taste of the original and the reduced fat – gotta love that! They also sent a $20 gift card to help pay for some potting soil to plant the wonderful seeds that were included with the Tricuits! One card of dill seeds and one card of basil. I didn’t have dill already growing, so I am really looking forward to that. I did have basil growing so I will use those seeds to extend the season. 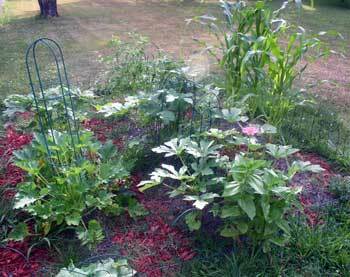 Growing herbs and veggies from seed is one of the most rewarding experiences you can have! Thank you Triscuit for encouraging this activity! 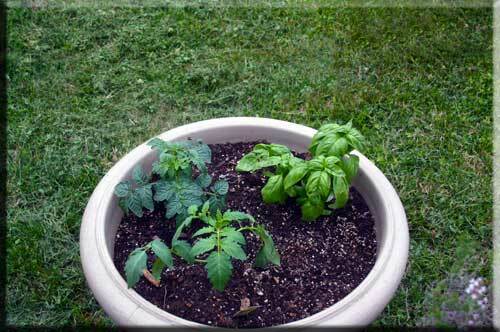 Y’all enjoy your time in the garden – even if it is just a pot on your patio! Something else yummy from the Triscuit website! Makes 4 servings, two topped crackers each. and What’s on the Menu Wednesday with Dining with Debbie! Love the combination of red and orange. 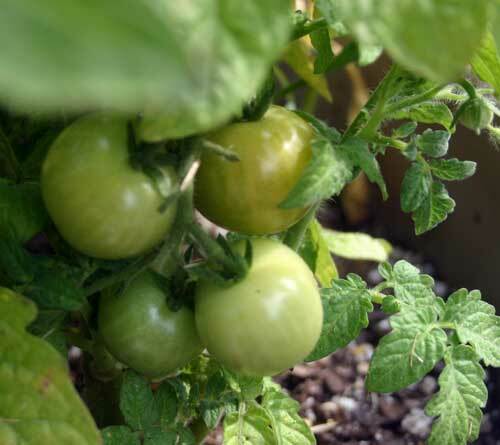 Below, you can see the cherry tomatoes are just beginning to take on a hint of red. Combine all the dressing ingredients and 1 to 2 tablespoons water in a blender or food processor; puree until smooth. Place the salad greens in a large bowl and top with the remaining salad ingredients. Drizzle with the dressing. A few outdoor pics for Outdoor Wednesday with A Southern Daydreamer and Rednesday! with It’s a Very Cherry. Happy Sunday! 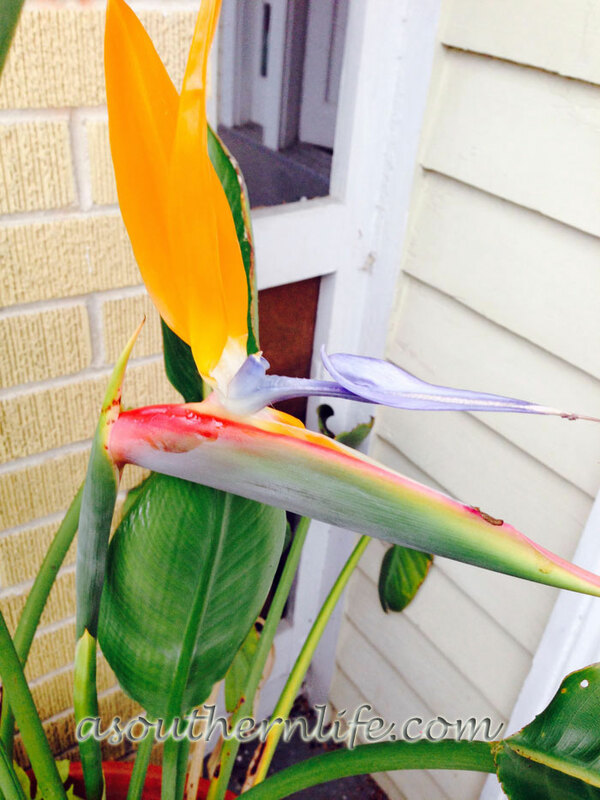 I am remembering a past post where I just took a stroll around the yard and enjoyed God’s majesty! O LORD, is the kingdom; you are exalted as head over all. 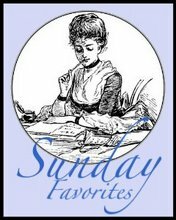 Join Chari at Happy to Design for Sunday favorites and Charlotte and Ginger at Blogger Spirit for Spiritual Sunday and enjoy your Sunday! We have had a lot of rain lately. This afternoon after the rain, I took a stroll through the yard and snapped a couple of pics for Outdoor Wednesday with A Southern Daydreamer. Click on the logo to see some great outdoor pics. Okay, so here we go for the stroll. 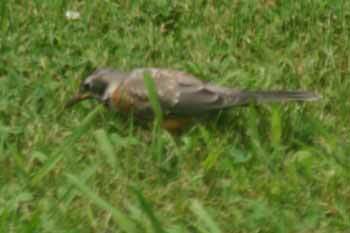 Here is another pic of the little robin teenager looking for worms. We are so glad that they have stuck around. Apparently, they will stay within 1/4 mile of the nest. Here is the garden. A little soggy,but loving the rain. Can’t wait to harvest some of the vegetables out of the garden. They are growing really fast. I usually already am able to harvest by this time but got a little bit of a late start this year. I've had this for a long time. I just moved it to the veggie garden. You can see the clover, as well as the veggies, love the rain. For She Has Found Her Private Paradise. This recipe is very similar to the Lemon Thyme Cookies, only with Rosemary. Hmmmm! In a medium bowl, cream together the butter and 2/3 cup of sugar until light and fluffy. Stir in the flour salt and rosemary until well blended. The dough will be somewhat soft. Cover and refrigerate for 1 hour. Preheat the oven to 375 degrees F (190 degrees F). Line cookie sheets with parchment paper. On a lightly floured surface, roll the dough out to 1/4 inch thickness. Cut into rectangles 1 1/2×2 inches in size. Place cookies 1 inch apart on the lined cookie sheets. Sprinkle the remaining sugar over the tops. Bake for 8 minutes in the preheated oven, or until golden at the edges. Cool on wire racks, and store in an airtight container at room temperature. As I have been working today, I have noticed the pink flowers pouring over the fence in the back. It reminds me of when I put in my garden last year as these flowers were blooming. Alas, I am not putting in my regular garden this year. I am gardening in pots. Too much going on right now for the full blown deal. Working in the garden can really tire you out. I think I really need a nice place to take a break. 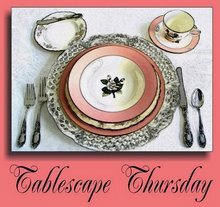 This is my tablescape entry this week in Tablescape Thursday hosted by Susan at Between Naps on the Porch. Y’all stay tuned. There are robins building a nest on my porch and I’m taking pics of their progress that I’ll be posting. A nice place to take a break. A couple of cookies - gotta keep up my strength! A couple of my favorite gardening books. A watering can with flowers. Hey, there's a bunny in my watering can! Everything I need . 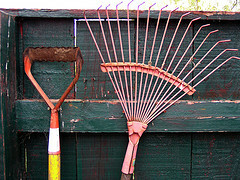 . .
for a nice break from gardening! Something light and easy to enjoy. Use your favorite salad greens and veggies and dress them with this lovely mustard vinaigrette. Easy! 1. Combine the mustard and vinegar in a glass or stainless steel bowl and whisk them together briefly. 2. Place the mustard-vinegar mixture along with the oil and seasonings in a blender and mix for about 10 seconds or until fully combined. 3. Serve right away, as the oil and vinegar will begin to separate as soon as you stop mixing. Makes 1 pint of dressing. Every year, I plant herbs. Sometimes I plant them in my her planter. Sometimes in my garden. But, always, I must have herbs in the garden. This year, I have put herbs in pots. Sorry I didn’t get the before pics. I got busy moving the huge pots and then planting them! 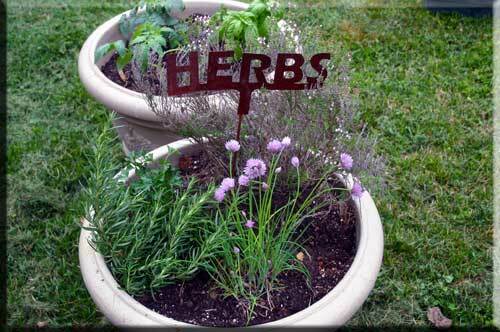 I moved my perennial herbs from their spot in the planter to pots and added a few additions. They thyme and chives are from previous plantings. The rosemary is new (last years planting did not last through the winter and I added some more parsley as well. Can’t live without the herbs that I grow in the garden! I also planted some cherry tomatoes along with some basil. 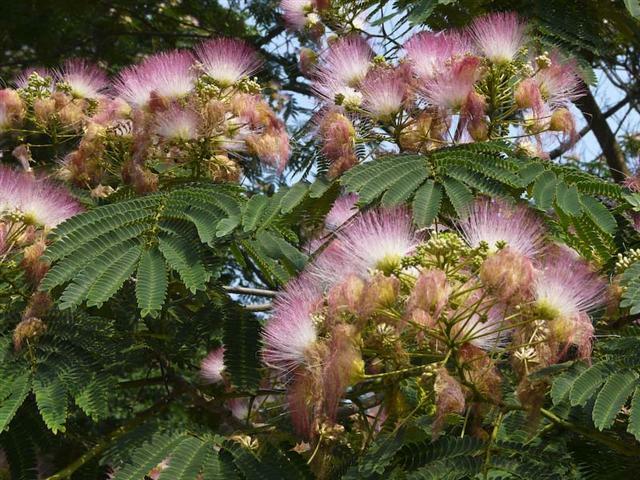 They are great companion plants. I plant to get some marigolds to plant along with them as well. 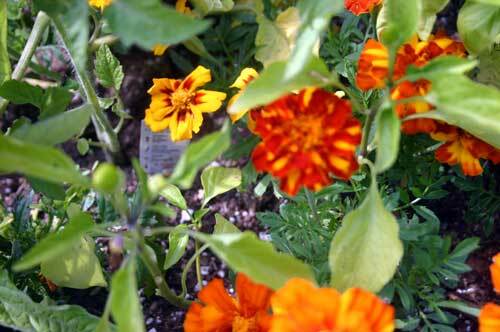 Planting marigolds with any garden improves the soil and is good for the other plants. 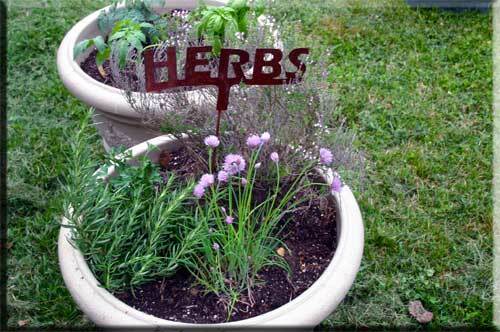 I call my new herb plantings my “herb-an renewal”! What renewals have you got going on? A wonderful way to use parsley from the garden, this sauce is great over grilled steaks! In a blender or food processor, combine the parsley, garlic, oil, vinegar, lemon juice, salt, ground black pepper and cayenne pepper. Mix well, but do not puree. Soon, it will be time to put in the garden. 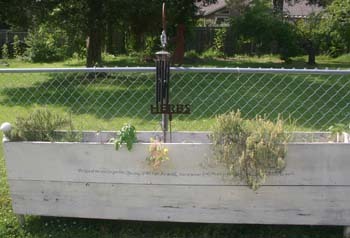 Gardening is an act of faith. Planting a seed and watching it grow is always miraculous to me. Man first met God in a garden. Jesus prayed in a garden. 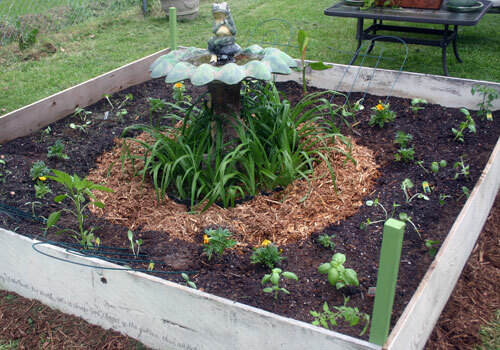 This is the weekend I put in my garden – starting today. 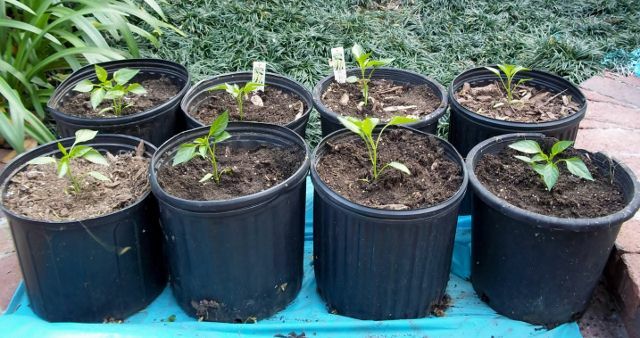 I’ve planted my seeds, tended the seedlings, transferred them into bigger pots and now, I’m ready for the real deal. I will be tilling the plot, getting rid of the grass and weeds, amending the soil, making rows, then TA DA!! !, planting the vegetables and flowers. 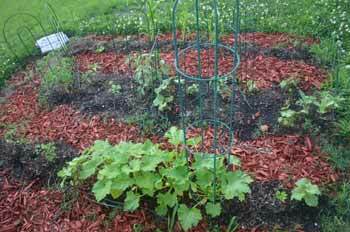 This is a pretty labor intensive way to save money, but, it is a labor of love. And, it is well worth it. Nothing tastes better than home-grown vegetables that you have tended with your own hands. Not only do I get to have yummy veggies and lovely flowers, I get to have the pleasure of accomplishment, the gratitude for the blessing of the earth and a connection to generations and generations going back forever who have planted seeds to grow food and flowers for their homes. 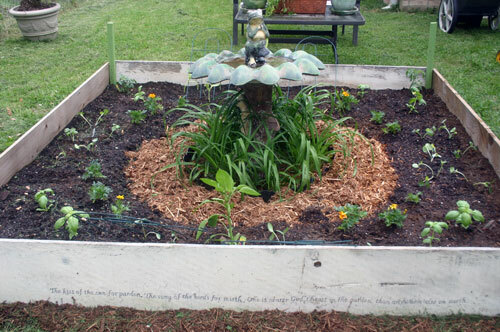 Here is some gardening wisdom from Mary Anne Potter of Herban Renewal Farms of Ponca City, Oklahoma. She is an herbal gardener who wrote a lovely book called Herbal Pleasures. 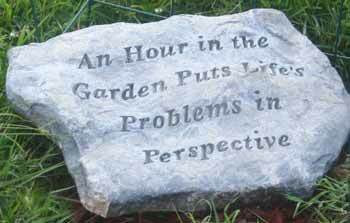 Her words of gardening wisdom are wise words for life as well. 1. Begin early. But it’s never too late to start. 2. If it doesn’t work, try something else. 3. Life is fragile. Protect it. 4. Life is enduring. Trust it. 5. Life is daily. Water it. Weed it. Prune it. 6. Life is indescribably beautiful. Enjoy it and say thank you. 7. Growth takes time. Be patient. And While you are waiting, pull a weed. 8. There’s something for everybody – different blooms for different rooms. 9. Pruning hurts. Pruning helps you grow. 10. Recycle. Reuse. Restore. Repair. Reduce. Redo. 11. Sometimes the tiniest flowers smell the sweetest. 12. To everything there is a season. 13. Dream big. 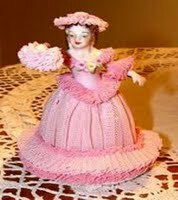 But try not to let your joy turn into drudgery. 14. Grow what you love. the love will keep it growing. 15. Remember, never kiss by the garden gate. Love is blind, but the neighbors ain’t. Isn’t that lovely? My mother gave me this lovely little book. Okay, off to the garden. I’ll take pics to show y’all next week. 1. Heat olive oil in medium size pan. 2. Add veggies, garlic, and salt and saute until soft. 3. While veggies are cooling a little, mix together eggs, ricotta, and Parmesan until fully combined. 4. Stir veggies into egg mixture and pour into pie shell. 5. Cook at 350 for 25-30 minutes.